Do you think your tablet is too little? You want a bigger one, but the majority in the tablet market are only 7 and 10 inch models. Toshiba is the solution, they will offer you bigger one, 13,3 inch tablet! This company has just launched a tablet with screen size of 13.3 inches. 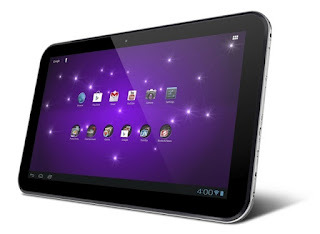 The tablet is part of the new line of Android tablet, Excite, and besides this 13.3, there are 7.7-inch and 10.1-inch models. They all have a front camera of 2 megapixel, and main camera of 5 megapixels, working on Android 4.0 and they have a Tegra processor. Excite 13 has LED screen with resolution of 1600x900, Excite 10 has a screen resolution of 1280x800, and Excite 7.7 model has the AMOLED display. Excite 10 and 13 have 13 hour battery life, say from Toshiba. As far as the price is concerned, Excite 10 will be on sale from 6th May at a price of $ 449.99 for the16GB version, with the Excite 13 and Excite 7.7 coming later, 10th June, at a price of $649.99 (32GB version) and $499.99. "Google Chrome: Coffee" Nice job by Google! Huawei Ascend P1 release dates are known! Is Google planing to sell Motorola?